The Farmers Market Coalition is possible with the support of member farmers market organizations, farmers, and their advocates. Presently, FMC has additional support from the Kresge Foundation, Lillian Goldman Charitable Trust, and through the CDC Communities Putting Prevention to Work Program. In addition, FMC works alongside a variety of agencies and nonprofit organizations with allied interests, including USDA Agricultural Marketing Service, USDA Risk Management Agency, the National Sustainable Agriculture Coalition, and several others. Embedded in our belief in farmers markets is the recognition that no single organization has the final word on what’s best for markets. Our membership in the National Farmers Market Consortium allows us to work alongside many forward-thinking national agencies and organizations to address some of the most pressing issues facing farmers markets. We join hands with them, and hope that you, too, will join hands with us as partners. We need your help, whether you are a farmer, an organization, health professional, parent looking for fresh food for your family, or citizen seeking safe public spaces in an otherwise dangerously private world. Visit the Join Us page of this website and become a member today. When you pledge financial support, we pledge to spend your contributions wisely as our small-staff organization grows. 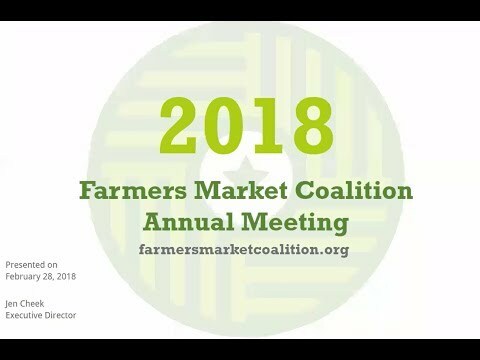 If you are a business or organization interested in supporting our organization through a sponsorship, please email info@farmersmarketcoalition.org.